Who are the leading theorists in international relations? What are the dominant issues in the history of international relations? How does the international market relate to a country’s government? What is the effect of processes of globalisation on the autonomy of the state? How does a just world order look like? Why is European integration so important? The aim of this one-year MA is to train students in one of these four specializations, in addition to acquiring thorough knowledge and understanding of the general themes in international relations. They will thus acquire a sufficiently broad as well as a specialized basis for either entering the job market or continuing on with an additional Master’s degree (NOHA, Euroculture). Questions of life and death are at the heart of the study of humankind, war and peace, strategy and diplomacy, and have challenged and inspired IR theory throughout history. IR theory, in turn, has guided the search for international order and for peaceful change, in particular. In this Master’s track, the centrality of both the phenomenon of violence – in a broad sense – and IR reflections thereupon – in a metaphysical, theoretical and historical sense – are dealt with. Since the 1970s, IPE developed as a more or less independent discipline within International Relations. It focuses on the interaction between states, markets and societies and how their mutual relations affect the behaviour of other actors. Its principle aim is to explain the dynamics of these three building blocks. In doing so, it relies heavily upon methods used in economics and political science. Special attention is paid to the relations between states, markets and society in developing and transition countries. European Integration concerns the analysis of history, theory and policies of the European Union and its member states. It approaches the EU as a unique example of regional cooperation, characterized by intergovernmental and supranational as well as political and economic elements. In addition, it is guided by a complex policymaking structure, in which the European, national and subnational levels to an increasing extent interact as a result of transnational and transgovernmental cooperation. This track focuses on the development of ‘international society’ and ‘world society’. International society is related to studying fluctuations in the kind and quality of anarchy and order between sovereign political communities in time (historical perspective) and place (international subsystems). World society is related to studying changing forms of transnational governance and its normative qualities. Historical and constructivist methodologies, as well as multilevel governance approaches are applied to interpret the interplay between these globalized realms of private and public interests. This course aims at the acquisition of knowledge of and insight in the theory of international relations: the major paradigms, various theoretical views of international relations (for instance ideology, ethics, diplomacy, and political culture) and the role of the state. The MA thesis is the final element of the IRIO study programme.The thesis should be a well-argued essay based on an analysis of a politically or socially relevant issue in international relations (complementary to the chosen area of specialization). The thesis should be the outcome of a substantial study of the relevant literature and sources and at least characterized by a multidisciplinary approach and theoretical grounding. 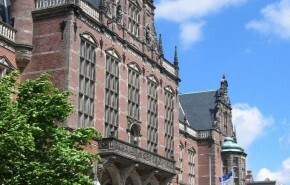 An IRIO lecturer will supervise the student during the preparation and writing of the thesis. The supervisor will also assess and mark the thesis on the basis of various predetermined criteria. The internship will give you the opportunity to gain work experience and explore employment opportunities. You will be expected to apply for a internship with an institute, organization or company either in the Netherlands or abroad yourself, based on your specialization, interests and skills. The internship has to last at least 10 weeks. About 70% of IRIO students follow a internship either with an international company or institute, or at an embassy abroad. Examples include the Permanent Representation of the UN in New York, the ABN-Amro bank in Singapore, the Dutch Embassy in Panama and Shell in Nigeria. To be admitted to the English-taught Master’s programme, students must have an internationally recognized BA in International Organizations and International Relations or a comparable degree in one of the following fields: International Politics and International Relations. A thorough background in the discipline and theoretical discourse of International Relations is an absolute necessity. A BA Thesis or a written essay is also one of the obligatory criteria for admission.